The electronic Fleetguard Master Catalog is a powerful and versatile tool. Quickly cross reference original equipment manufacturer and competitor parts to the Fleetguard equivalent, or select specific equipment applications for various market segments (On Highway, Off Highway, Industrial, etc.). To Order: Discover the many features of Fleet Manager in 10 local languages. 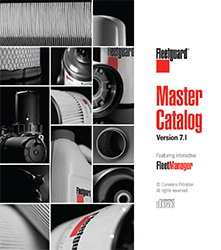 To receive the latest 7.1 version of Fleet Manager, please order from our Order Literature (North America only) or request through your local Cummins Filtration Distribution Center by requesting literature number LT20289.